Stock trading strategies consists of many parts. These parts are the entry system, the exit system, a method to reduce risk and a money management system. For every trader there are multiple ways which are likely acceptable for each of these four parts. Thus, for any one given trader there are multiple stock trading strategies. A very good understanding of this point is presented in the Market Wizards a book by Jack Schwager. 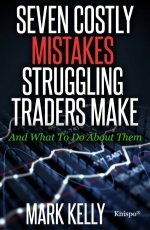 In this book, Jack interviews many top traders and all of them use different systems, which tells me that the system is not important part, it is the trader. To win, I must do certain things in a certain way. To win, I will use this plan to interact with the market. Using this plan is the way I gain control over the market. It is one way out of thousands of ways I could have chosen, i.e., there is nothing special about this plan. This plan, only identifies setups, it is how I manage the trade which will make me money. The reason I put this statement into my stock trading strategy is to remind me that the strategy is only as good as the trader. It has been well documented, by many trading coaches, that after teaching multiple students the same strategy and then presenting them with a number of trades some of the students will go bankrupt others will break even and others will make a lot of money. Thus, it is very clear that the system you use has very little to do with your ultimate profits. However, you have to start somewhere. Most beginner traders feel that the entry point is the most important part of a stock trading strategy. In case you didn’t realize it, from the above paragraph, the trader’s mindset is actually the most important part of all stock trading strategies. However, the average trader likely does not want to hear about this, they just want to know how to get into the trade. Thus, you could give them an absolutely perfect system and if their mindset is not correct they will lose money and blame the system. It is always easier to find another system than it is to improve your mindset. On this page, I want to walk through the building of an entry system. By becoming a member of stockcharts.com you can use the code here to find potential candidates. You can also modify the code as you see fit. Since the average trader always feels that their setpoints are better than anybody else’s setpoints I suspect that the first thing you will do is change some of the setpoints and that is totally fine because they are chosen for me not for you. I got the initial idea for this concept from an article called “Simplify It” which I found in the November 2015 issue of Technical Analysis of Stocks & Commodities ﻿ magazine. 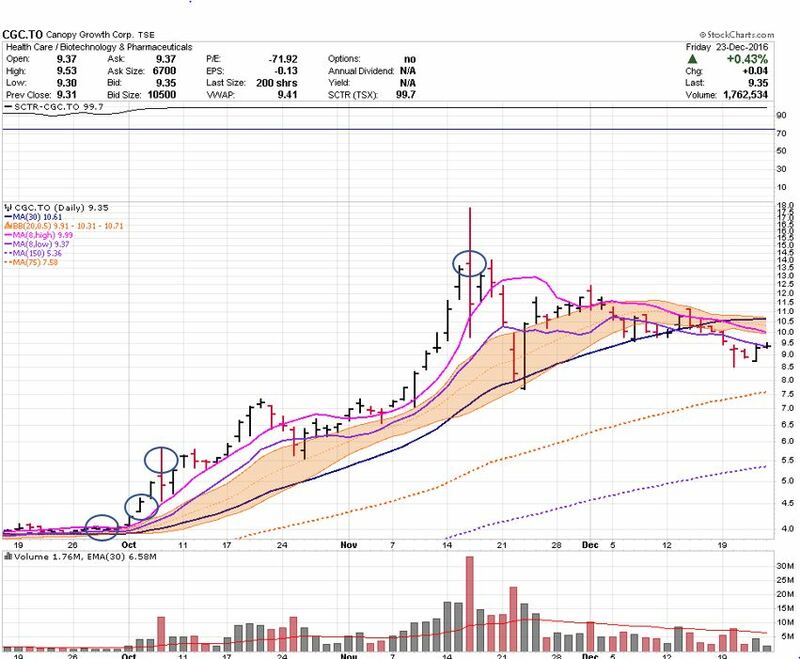 The only line that I took out of this article was to buy on a close above the eight period moving average of the high. Jake Bernstein, a well-known coach, commodities trader and the author of an excellent book called the The Investor's Quotient: The Psychology of Successful Investing in Commodities & Stocks , which I highly recommend, also uses a similar system. Since I was already vaguely familiar with the concept I thought I would explore it further. Stock trading strategies can be used in multiple time frames. Typically, I trade off of weekly charts simply because there is less work involved, I don’t need to monitor the price action as much, I can easily do this while maintaining a full-time career and I stay in the trade longer which typically produces greater profits. However, there are times when I would like to do a quick trade just to keep the money flowing. Thus, for this entry method, I will be working off of daily charts. The code below can be used on stockcharts.com as written or as mentioned above you can change it as you see fit. For instance, you might just want to look at penny stocks or you may not be interested in stocks below $20 and so you will need to adjust these parameters. You could also change the volume parameters. Alternately, you could decide that an eight day moving average is too short or too long. You might want to use an exponential moving average instead of a simple moving average. I have used the weekly averages in this code to ensure that the trend is essentially up. If you don’t care if the trend up on a weekly basis then you might want to remove these filters. As I said in the beginning, this is just a code to find potential trades, that’s it. It is not the Holy Grail, you will still need to work. Typically, over the longer term I expect approximately 50% of the trades to be winners and 50% to be losers. On the winning side, likely 10 to 20% will be large winners, 30 to 40% will be average winners, 45 to 48% will be average losers and perhaps 2 to 5% will be large losers. One way you can increase the number of large losers and large winners is to play the pharmaceutical game. When the Food and Drug Administration (FDA) allows or denies a drug for a small company the stock can go through the roof or floor resulting in a large gain or a large loss. There is absolutely nothing you can do about it since the majority of these decisions are made when the market is closed so there is no way to get out of your position even if you know the result before the market opens. If this scares you then don’t trade pharmaceuticals or biotechnology stocks. As has been documented in multiple books, websites and workshops in a typical year, most traders make most of their money from the 10 to 20% of stocks which ultimately become large winners. This is one reason your stock trading strategy needs to allow you to "ride your winners". While it would be great just to buy these stocks and forget about the rest typically, you don’t know when you buy which ones are going to become the big winners. Are highly volatile as I can never figure out where I would get out. If I can’t figure out where to get out then my risk is too great so I don’t take the trade. Have already had a major move. Of course stocks that have already moved 50% in a month could continue their uptrend but I typically look for a less risky trade. When the stock has risen sharply and then had a period of consolidation then I may consider taking the trade. Have low volatility. In some cases stocks move so slowly that it is just not worth purchasing them. If over a whole year they’ve only moved 10% then I am really not that interested. Have overnight gaps. These are typically found in stocks which are traded in markets in Europe or in Asia. These stocks are very evident on daily charts as they are filled with gaps. While some of these may be very good trades they also increase the risk so I typically don’t trade them. Have low volume. Typically, this can be handled in the code. However, sometimes there’s movements before holidays in which the volume is extremely low. In some cases I might take this trade, it really depends on the set up. In some cases, I find that the code above alerts me to stocks that are building a base. That is, the stock is either building a sideways consolidation or an ascending triangle. In these cases, I will place a buy on stop just the above the high of the pattern. 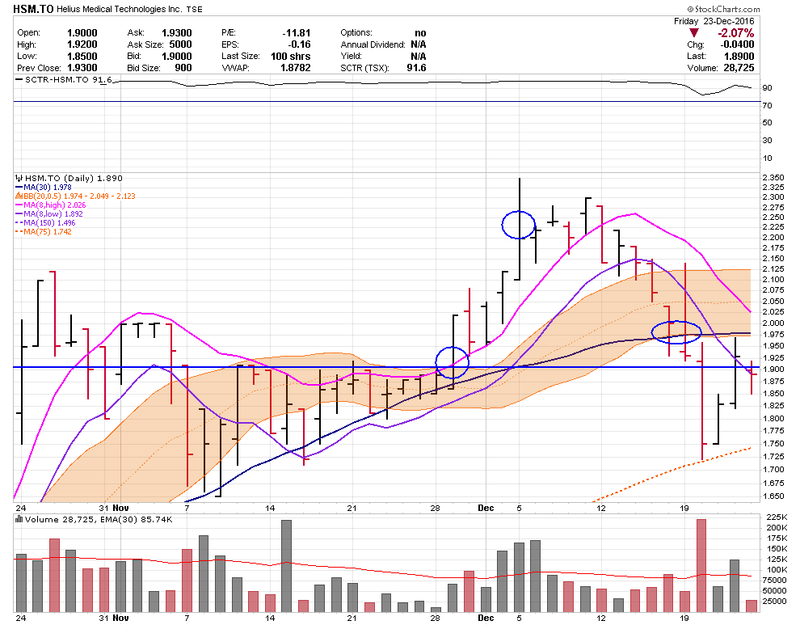 This is shown below in a trade that I did on HSM which is traded on the Toronto Stock exchange. In this case, the volume averages I used were lower than shown in the above code. I saw the stock on the cross of the eight day moving average two days before it broke out. I placed a buy on stop just above the highs and picked up the stock while I was at work. I sold half of my position around $2.20 and the last half just above the purchase price of $1.91. In hindsight, I should’ve sold at $2.09 which is just below the low of the largest high-volume day on December 5. Charts on this page are courtesy of StockCharts.com. One of the biggest winners I’ve had to date using this stock trading strategy was Canopy Growth. I picked this up in late September 2016. I sold half of my position after a 10% move, and then a quarter of my position around $5.50 after they announced that they had signed with Snoop Dogg. I sold another 15% at the open on November 16, which was the day the stock went crazy and did a reversal. I continue to hold my remaining shares as I have no idea where this stock is going to go and it seems to be one of the better marijuana stocks which could go through the roof when Canada and more US states legalize marijuana. Just to ensure you that not all stock trades work out I have included a losing trade which I did around the same time period. 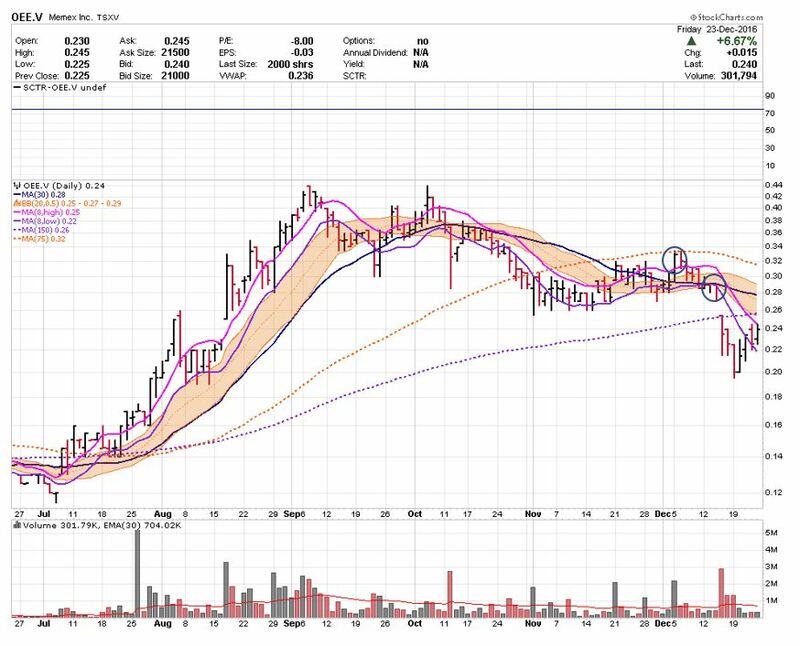 In this case the stock had a high-volume move above previous resistance and look like it was destined to go up however, I pretty much purchased it at the short-term high and sold quickly thereafter as it broke down. This is one reason why you need to get out as quickly as possible once you identify that the stock is not doing what you expected it to do. So, to summarize, stock trading strategies consists of many parts. The above discussion talked about the entry system which many people believe is the most important part of the stock trading strategy. Unfortunately, while it is an important part, it is not the most important part. For instance, you can get in at the perfect point in time, miss the selling opportunity and then end up losing money. What was more important, your entry or your exit strategy or perhaps your mindset? Dr. Alexander Elder presents a good path forward for those who want to learn to trade with more depth.